On average, we spend 25-30 hours per week in an office chair. The job of an office chair is to properly support your body for long hours….day in, day out for many years. In a nut shell a good chair provides adequate lumbar and pelvic support which results in less stress on your back muscles. Unfortunately, there are numerous chairs flooded on the market that do not offer sufficient support and when combined with long durations of sitting down at work, it is no wonder why there has been an increase of reported back issues in the workplace. Yet despite this, office chairs are still purchased without much thought – often comparing costs only. Well gone are the days when people would be content with sitting on office chairs with only a height adjustable feature! Office environments have come a long way since the days of cubicles & mediocre seating. Increasingly, they are becoming extensions of our living environments empowering us to work productively. The combination of sustainability, ergonomics, quality & design play a major factor in determining what makes a innovative seat and thankfully task chair development has been at the forefront of the workplace evolution. Criteria for Choosing an Office Chair? Comfort – A rule of thumb: next time you are searching for an office chair, try all of them without looking at the price tag. Comfort should be the first on the checklist and this will help you make an unbiased choice. Quality – This means that the components of a task chair should be consistent quality in terms of material composition, assembled fit and finish and overall functional integrity. This also extends to the quality of the brand. Choose a brand with a solid reputation and one that is constantly innovating themselves with the latest technology features, research and development. 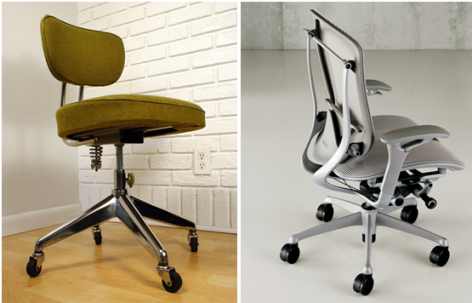 Durability – The price of a chair will reflect two things: quality and durability. As the old saying goes – you pay for what you get. With that in mind, it’s important to invest in a product that will remain applicable for a long period of time. Safety & Ergonomics – Seating that satisfies all industry safety standards and provides a range of good ergonomic support. Design – Human beings are very visual and naturally want something that is easy on the eye. Therefore companies are putting more effort into the aesthetics of a chair. This definitely comes down to preference but we favor the mesh chairs for their look and easy maintenance. Technology will constantly change the environments that surround us but one thing that remains in most cases is the need to be seated. It is therefore crucial to support your working body. It’s a pretty simple equation…proper support = better posture + breathing + health which in the end means a better life. You will be amazed at the difference a good quality tasks chair will make. Visit our showroom in Fontabelle and try out our large range of seating!